I have been cutting paper images for over 20 years, beginning in middle school with Birthday and Christmas cards for family members. Over the years these special occasion cards developed in complexity becoming gifts themselves. During college I began making wall art after discovering artist text papers that have higher cotton content, are UV resistant, acid-free and more brightly colored than regular construction paper. Since then the paper images have taken on deeper depth and intricacy. Using various self-taught techniques of layering, stacking, and piecing some of my works may contain over a thousand individually cut parts. In addition to making wall art I’ve explored the possibility of wearable art through mounting extremely small paper images in silver and glass to create pins, allowing people to carry their landscapes and gardens with them. 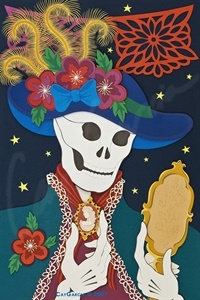 In the past few years the Day of the Dead images I have created have become especially popular and are featured in many of the miniature scenes I create. Cay lives in Albuquerque, New Mexico with her husband and their two children and works out of a studio at 105 Studios located at 4th St. and Central. Please contact me if you would like to know about images available in prints, magnets or note cards. Content copyright by Cay Garcia.